Beach Lane Books, 9781481411479, 224pp. Ivy and Paul hatch a secret plan to find Ivy’s missing mom and say good-bye to the space shuttle in this evocative, heartfelt novel reminiscent of Each Little Bird that Sings and Because of Winn-Dixie. At the outset of summer in the fictional town of Loomer, Texas, Ivy ponders how she is missing a dog, a middle name, and her mother, who has left home without her medication to become part of the Great Good Bible Church of Panhandle, Florida. Set in 2011, the novel begins in the aftermath of a fire in Texas that destroyed hundreds of homes, an event that inspired Ivy’s mother to set out on a search for something. Ivy and her dad do not know why she left or what she is searching for. They have no idea of her whereabouts, because no one knows where the Great Good Bible Church is. Ivy takes solace in her teacher, Mrs. Murray, whose young children she babysits. Circumspect about people’s judgments, Ivy wonders why her mother considers Mrs. Murray kooky when she does so many helpful things for the community and children as coach, teacher, and mother. She delivers the paper every day, writes novels in the summer, and has potted hydrangea. Ivy decides she is “normal as can be,” especially in light of the understanding that “nobody at the Murray house followed a perfect stranger to Florida for the summer, if you know what I mean.” While babysitting, Ivy meets Paul Dobbs, a remote-controlled airplane enthusiast who wants to be an astronaut, and together they make a plan to find Ivy’s mother in Florida. 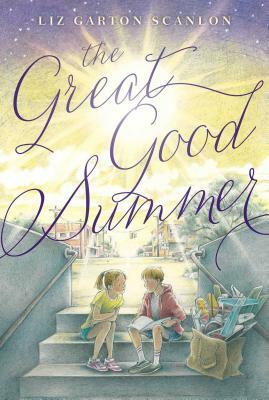 This fast-paced novel includes a journey during which Ivy learns about friendship and standing up for what she believes is right and valuable with humorous insights into the routine and not-so-routine moments of life. It’sa rare book that can discuss faith without verging into the preachy and contemplating the nature of God while acknowledging some people’s lack of belief—all in the voice of an earnest, honest twelve-year old girl. Scanlon manages it in this story of Ivy Green, whose world has turned upside down following her mother’s sudden departure with a holy rolling preacher, elegantly and non-judgmentally addresses belief and non-belief while keeping its focus squarely on the power and mystery of human relationships. When narrator Ivy andher classmate, the science-minded Paul, concoct a plan to leave their small Texas town and track down Ivy’s mother in the Florida panhandle, Ivy struggles to confront the complicated emotions that arise within the intricate bonds of family and friendship. She also learns about herself and her own strength ofcharacter, and the sympathetic and engaging portrayal of Ivy avoids advancing a moral and instead celebrates her personal revelations. Heartfelt in content and authentic in tone, this will resonate with kids questioning their parents, God,or both.